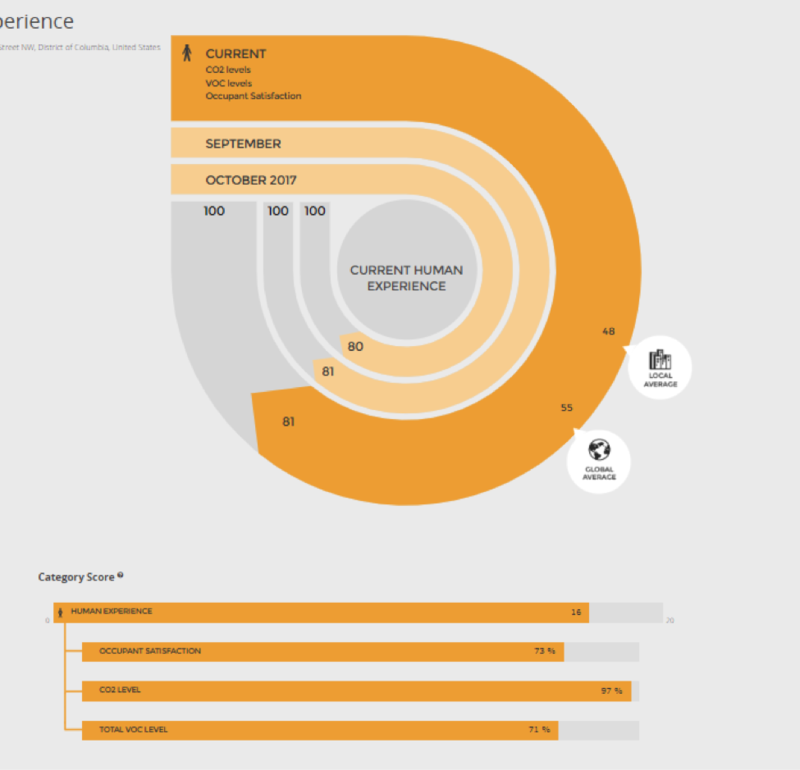 Learn about the Human Experience metric in Arc's performance score. Employees are happier, healthier and more productive in LEED green buildings, according to a new survey from USGBC. The survey also shows that a majority of office workers want to work for companies that are value-oriented, take stances on important issues like sustainability and do their part for making a positive difference in the world. LEED buildings are linked to improved productivity, health and wellness, and the survey showed that these attributes, as well as a space that provides clean and high-quality indoor air, directly contribute to employees feeling happy and fulfilled at work. By continuously benchmarking in Arc and measuring human experience indicators, data can help architects, engineers, building owners and managers enhance the connection between buildings and its occupants. Providing this data will generate a score between 0 and 100, and compares performance over time as well as with regional and global peers. Each data point contributes individually to the score and collectively offers the overall score for Human Experience. Arc determines occupant satisfaction using a survey administered to building occupants at least once per 12 months.Survey takers respond to the question “How satisfied are you with the environment in the building?” Respondents rate their experience from 1 (extremely unsatisfied) to 10 (extremely satisfied). Anyone who is dissatisfied can provide more details to help teams understand the attribute of the building causing this response. The score is calculated by taking the average satisfaction levels reported. The higher the overall satisfaction, the better the score. Indoor air evaluation, reflecting interior CO2 and interior TVOC levels, generates a score for these two metrics. The information must be gathered by doing an indoor air evaluation every 12 months. That data is put into the platform, which generates scores for each metric. Interior CO2 levels need to be under 1,000 parts per million for a score to generate and interior TVOC levels need to be under 500 micrograms per cubic meter to receive a score. The lower the levels of each parameter, the better the score. Projects teams will need to provide a narrative describing procedures, device used, specification sheet and calibration information, how locations were determined, dates, times and the results from each sampling, to support the data provided. This information is reviewed by GBCI. Teams can export data to further analyze and understand the use and experience in the space. The Portfolio feature in the platform helps organizations compare and consolidate information across multiple buildings in the portfolio. If your building is LEED-certified, it is already in Arc. You can log in at arcskoru.com using your USGBC username and password, or you can contact us to see your score and start tracking today. Learn more about scoring and analytics with the Arc YouTube playlist.